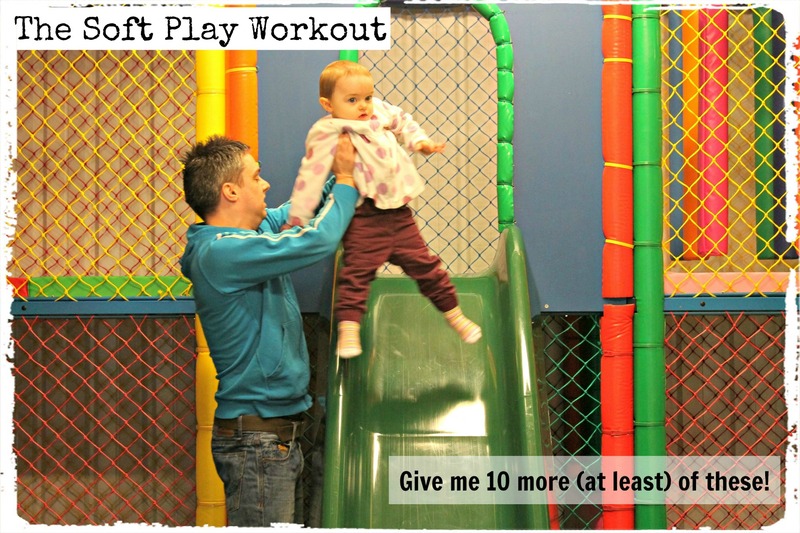 The Soft Play Workout – guaranteed to make you sweat, if nothing else. My name is Tara and I have a confession *whispers* I like going to soft play centres with Freya. Now, before you think I’ve gone completely potty, let me reassure you that it’s not because I enjoy the slightly Lord of the Flies style atmosphere or that I like my child crawling around with dust bunnies older than I am. You see, while Freya might have taken her first steps at 10 months and was walking by one, she still falls over at the drop of a hat (or a gust of wind) and is also a bit of a scaredy cat, which means journeying into the deep, dark depths of the padded scaffolding on her own is not on the cards. As a result, I spend a good deal of my time clambering over things, repeatedly hauling her up (and down) slides (as ably demonstrated by my husband) and scrambling in and out of quicksand-like ball pits. It’s like some sort of indoor, padded, not quite as dirty, army assault course with the added bonus that I’m only paying for Freya (as, you know, technically, I shouldn’t really be on the equipment). In fact, I’m thinking of going legit and offering some sort of bootcamp-like class* where I get to yell at other parents (only as I would have to shout over the ear-splittingly loud cheesy pop music to be heard, obviously) because all that effort has got to be at least a little bit good for you? (Especially if you can keep away from the chips and cake** on sale in the cafe). And that’s the reason why I like it. The first time I took Freya I couldn’t work out why I ached the next day but then I realised it was because I had used muscles that I didn’t even know I had. So you can forget your BuggyFit, Insanity or even SoulCycle, if you happen to be David Beckham (although he would be more than welcome in my class with or without Harper), and instead join me for the Soft Play Workout. I can’t guarantee you abs of steel or even that you will lose weight (see cafe reference above) but you will get a good sweat on (particularly as, generally, you will be in civilian clothes rather than sports gear) and it will probably make you feel 20 (more like 25 in my case) years younger as you go down a slide for the first time as an adult. I know I need to enjoy it while I can as it won’t be too much longer before Freya does the “Mum, you’re embarrassing me!” speech, or whatever the toddler equivalent might be, and I’ll be consigned to the sidelines drinking coffee and scanning my Twitter feed with the rest of the mums while she careens around having fun. Although, hold on, that doesn’t sound too bad either! I think I might like soft play even more. ** Not at the same time, unless it’s a really bad day. Previous postMy Sunday Photo – week 14. Next postReview: Odylique by Essential Care Timeless Rose Moisturiser.